Special 8-2 is the second level of Special 8 in Super Mario 3D Land. It is based off of World 8-3. 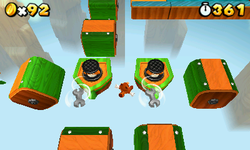 The player starts off on a small wooden platform in front of several rotating platforms and a Rocky Wrench. After this section is an area of rotating platforms that leads to a platform with several Rocky Wrenches and a Green Shell on it. After this is a large rotating platform that leads to another large rotating platform and the Goal Pole. Star Medal 1: Floating above one of the rotating platforms. Star Medal 2: Near the first Star Medal is a Warp Pipe with a Rocky Wrench inside of it. After the Rocky Wrench is defeated, the player can use the Warp Pipe to get to an area with a gear that can be spun by Tanooki Mario. The Star Medal is at the top of the platform. Star Medal 3: Near the end of the level, a smaller rotating platform with a Warp Box can be seen. The Star Medal is floating on this platform.